I'm excited to be speaking at the upcoming Modern Apps LIVE! conference co-located at the Visual Studio LIVE!, LIVE! 360 Las Vegas conference March 16-20. This conference track has a fantastic lineup of speakers including Jason Bock, Brent Edwards, Anthony Handley, Rocky Lhotka, and Kevin Ford with a variety of topics surrounding Modern Application Development. 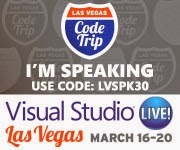 There is still time to save $500 using my speaker registration code: LVSPK30 Click on the banner below to go straight to the registration page. I hope to see you there and don't miss out on the registration savings above! !